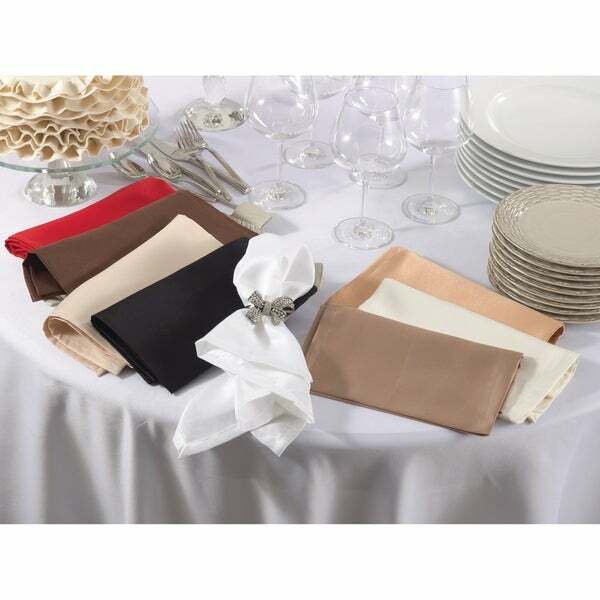 Enjoy the classic, timeless style of these durable satin dinner napkins. Not only do these dinner napkins offer an elegant solution to the impromptu dinner party, they can also be used to dress up the everyday table. Machine washable and crafted of durable polyester, these napkins can stand up to the test of time. We are well pleased with our Navy Blue Satin Dinner Napkins. They are soft even out of the package, and wash up well time after time. The color goes well with our harvest gold tablecloth and oyster white walls. We're trying to find the right napkin rings as they are quite large. I have used these napkins about 4 times now, and they wash beautifully in between uses. They are very large and a quality material. I love these napkins. These satin dinner napkins look great, are easy to wash -- just throw them in the washer. Good buy. I keep my dining room table set all the time, just as a decorative accent so I've only had these out on the place settings and I find them very attractive. Whether or not they stand up to actual use is yet to be determined. These are top quality and make our dinners awesome. Just what I wanted and they are durable! These napkins were great quality. This set is great -- perfect for large gatherings, largely because you get 12 in the set. They're oversized, so look good on the table in a pretty napkin ring, they're absorbent, and they don't wrinkle much. Great price too! WOW! high quality cloth and stitching. Much thicker than I thought they would be. These napkins are an excellent quality and I will be proud to have them on my table. Perfect addition to any sit down dinner event. Perfect for Christening party..Matches decor perfectly.. These napkins are great for entertaining or for decorative purposes. They launder well and Keep their original shape. They do not fade when washed. They’re even nicer than the pictures show and I’m So excited to pair them with the napkin rings I also purchased as well. These napkins are beautiful as pictured! Very nice quality and they look great, too. Very nice quality for the price, vivid color and nicely finished. Washes nicely without turning into a wrinkled mess... fast delivery.. would highly recommend..! nice no wrinkles. Perfect! These are by far the nicest napkins ordered from Overstock! Super soft real color and look HIGH QUALITY! "very satisfied with these napkins. what is the best way to wash/clean them? Thanks!" These napkins are machine washable. Replacement for napkins that are wonout.